“Ender’s Game” by Orson Scott Card is the story of a young child on whom the fate of humanity rests. In this futuristic tale, the Earth has come under attack twice by the devastating “buggers.” United by the shared threat, the world government of Earth tasks itself with finding the one person that can lead humanity to victory in the next battle. That government looks to its children to find that leader. Andrew Wiggin, aka Ender, is the third and youngest child in his family. Most families are only allowed to have two children, but the government found both of Ender’s siblings (ruthless Peter and compassionate Valentine) to be so close to the type of leader that they were looking for that they allowed a third child hoping that one would be a cross between the two. (There is a subplot in the book of how Ender’s siblings rise to political prominence on Earth, and it is pretty good, but a lot to go into right here). After monitoring young Ender from the age of three to the age of six, the International Fleet decides that it is time to begin training Ender for his life’s mission. Ender is removed from his family and sent to Battle School. At Battle School, children are trained for war using games, both computer and physical scenarios, that only get progressively harder. Ender is surrounded by other elite children but, in an effort to make him into the leader he needs to be by his instructors, Ender is systematically isolated socially from his fellow students in obviously cruel yet (to the instructors, at any rate) necessary ways. Despite these measures and the pressure and stress of the environment, Ender excels, advancing quickly, moving from shunned child to awe-inspiring leader. It is a path that makes enemies and repeatedly Ender finds himself having to defend himself from violent attacks. Throughout the novel, Ender and the situations he is placed in are manipulated by his instructors. Despite realizing this, Ender continues his training for a greater purpose. The manipulation comes to a dramatic conclusion when Ender discovers that the latest series of “games” he has been training with are actual remote battles near the Buggers’ home world, and he is responsible for the genocide of that race of beings. The book ends with Ender coming to learn about his enemies and, in fact, becoming their hope for a future existence. But, that is another book altogether. 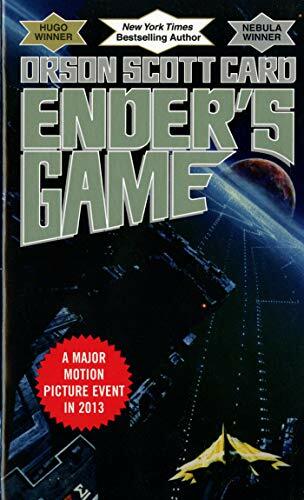 OG: As referenced in on of my recent blog postings of shame, “Ender’s Game” is on that list of revered sci-fi books that I’ve regretted never having read. And, to be honest, until the idea of the book club came about it was one that I think I never would have gotten around to. Something about seeing the letters YA on the spine of it at the library made me think that the time for this book in my life had passed. I assumed (very, very wrongly) that it must be geared towards kids only, wouldn’t resonate with me anymore, and would perhaps be too simplistic due to its designated audience. Well, I couldn’t have been more wrong on all counts. This is a challenging, complex, and heady novel in all the right ways. In fact, I’m gonna drop this little hyperbole bomb early in my reaction here so as to make it clear what direction I’m going to go: “Ender’s Game” is a masterpiece. EG: Ender’s Game blew chunks!!! It was horrible! It was…actually, all that is a lie. I just wanted to find some way to disagree with you about this, but I can’t. I have to say, I thoroughly enjoyed this book, despite the unconscionable acts of the adults within, the obvious child abuse, and the systematic destruction of a kid’s psyche. The book is one of the best science fiction novels I’ve ever read. My copy didn’t have the “juvenile fiction” stigma emblazoned on its spine, so I went in without any thoughts that this could be a book for the younger set. Of course, now having read it, I can see the definite youth appeal of the book. OG: I agree that it totally works for guys our advanced age, but I will say, my biggest regret having not read this until now is that I sure could have used this book back in middles school or high school. Granted, the character of Ender Wiggin is a remarkable child, one far smarter than I was then or am even now, but the alienation and distress he experiences in the battle school is drawn so effectively by Card that I can’t imagine many children who wouldn’t respond to it in some deeply personal way. But, not only that, I would wager that over the past two decades this book has probably given a lot of kids the insight into the bullies and thugs in their lives which helped them to cope with and endure the special kind of cruelty that kids can visit upon one and other. EG: Exactly. I mean, when I was a kid I was stuck in some advanced programs (not bragging her – those things only breed social retardation – nothing to be proud of there), so I immediately related to the main character. But, as you said, virtually any early teen could relate to the alienation factor. Which, actually, while I’m thinking about it, is my one gripe about the book. There was one aspect of the whole novel that I simply couldn’t suspend disbelief on – the ages. A six year old going through all of this? Even granting it being the future and the advanced intelligence of the characters, I could not resolve that in my mind. What I ended up doing a lot of the time was moving the age up by about four years in my head. Somehow that was enough to overcome my disbelief…until the text mentioned the ages again, and I was momentarily taken out of the story by those speed bumps. But, if that is my only gripe about a book, I’m thankful. OG: I’m really glad you brought the age issue up. Much as I loved this book, I had the same trouble you did. It was really off-putting at first. Somehow I was eventually able to suspend disbelief sufficiently enough, but I still can’t imagine why Card chose to make the kids in the story this young. After reading this I even looked up a lot of interviews with Card and commentary on the novel trying to find this out and never found anything where this was addressed. I think I only ultimately made peace with it while reading because I kept assuming that the story would leap ahead a few years at some point and make my concerns moot. Even though it never did, I think that that false assumption coupled with the strong distraction of a really well-told story got me to a point where I wasn’t even thinking about Ender’s age anymore. Like you, it only flooded back into my thoughts and became a distraction whenever the author made a point to bring it up. Actually, if anything, the character’s ages had me thinking a lot of another book along the way. And, again, it’s a book that I didn’t get around to reading until quite recently – “The Lord of the Flies.” In many ways, “Ender’s Game” seems very much like the complete inverse of that premise, but I could only focus on the obvious similarities. The biggest difference between the two is that of the presence and influence of adults. While authority figures are completely absent in “Lord of the Flies,” they are critically influential on the events and overall plot of “Ender’s Game.” But, despite that, the adults at the Battle School are hardly seen and never intervene overtly. So, ultimately, both books end up being about boys left to their own devices and what happens in that situation. And, if Card is to be believed, it doesn’t matter if there is chaos (as on the island of “Flies”) or order (as in the Battle School) boys will be boys and that can be a very bad, very devastating thing. OG: Curse you EG! Always reminding me of more things that I haven’t read. Go on. EG: Mind you, both of those dealt with cloning, but they also dealt with manipulating the cloned children so that they would grow up a certain way. And, since I brought up “The Boys from Brazil,” which deals with the cloning of Hitler, I’ll throw in my Nazi reference here as well. The manipulation of Ender by Graff seems very Mengele-esque to me…he fully realizes that what he is doing is destroying Ender, yet continues to do it for the greater ideal. And, there is no real guarantee any of it will work – it is all an experiment, one which we are given indications has not worked on other children, causing them to commit suicide. In the case of Ender, there are camps that would say that the greater good is served, but there are also camps that would say that losing one’s soul in the process negates the greater good. OG: Well, I definitely want to delve into the Nazi comparison because I have some thoughts on that. But first, regarding “Lord of the Flies,” I would say you’re absolutely correct about the difference between the two, but I think there is still something in both books that wants to explore the inherent cruelty of children and how they deal with it in social groups. The biggest difference between the two really is how the different heroes of the books deal with it. Ralph in “Flies” is unable to keep control or keep the chaos and cruelty at bay. Ender, in contrast, fulfills his role as leader and overcomes all obstacles, bringing many of the boys with him as he does so. To boil it down, her argument is that “Ender’s Game” is a defense for Hitler and other perpetrators of genocide because it makes the argument that Hitler, like Ender, can be excused for his actions because of a rough upbringing and because he thought what he was doing was right. I think her argument completely misses the point of the book. You can’t even argue that Ender is engaging in the faulty “I was just following orders” Nuremburg defense because he was completely in the dark the whole time. He was hoodwinked and the real comparison to the Nazis, if one is to be made, is the one you made to Graff. He’s the one making the “genocide for the greater good” excuses. And, while Card tries to portray Graff’s struggle in human terms I don’t think he ultimately lets him off the hook or gives him an easy excuse. EG: Yeah, I’m going to have to call that comparison faulty. There is a big difference between having a rough upbringing and being purposefully manipulated. (A quick aside – The Boys from Brazil focuses on the idea of trying to place clones in similar situations to the original person to get them to develop in the same way – and raises the same sorts of questions about whether a person is condemned by circumstance or able to rise above.) I would even argue that Hitler could’ve risen above his circumstances, but that Ender, as long as he was seen as the “great hope,” never had that chance because they were not going to stop manipulating him into their ideal military commander until he succeeded or lost his mind or died. We are talking about a teenager who has been tricked into committing genocide, something he might have figured out on his own if their measures had not deprived him of sleep and rest for such an extended period of time. And to finally reach the completion of your “training,” only to be told it was all real? That your orders and actions and plans had resulted in not only the death of your own forces, but the obliteration of an entire alien race? If Ender is to be considered a monster, then how much more so are those that “created” him? I suppose, if I had a second gripe with the book, it would related to how quickly Ender recovers (or, at least, manages to cope) with discovering he has committed genocide. And, then the kicker – discovering that the first two attacks from the Buggers was a mistake, that they had no clue humans were intelligent life? Top that with the fact that the Buggers realized they were going to be destroyed and left their legacy to the architect of their destruction? I don’t know. I mean, I think I wanted something more from Ender. I guess I could be wrong here, now that I think about it. I was thinking I wanted a more fiery and fierce righteous indignation against the people that manipulated him, maybe more grief over what he had done to the Buggers…but by that point in the story, his head had been played with so much that maybe all that was left was what we were given. OG: True. And, I see where you’re coming from in your wanting more from him in the way of rage at that moment. It’s certainly what we feel as the reader. But, since we know how incredibly intuitive Ender is in his understanding of his opponents every stop along the way, I think we can infer that he immediately realized that righteous indignation or any outburst would be fruitless. At the moment the truth is revealed to him, he can see right away that the whole system is rigged so completely and he knows that there is no benefit to striking out at that point. Instead, he bides his time, gets to the bottom of things, and once he has the egg-sac he plots to renew the Bugger race to try and counterbalance what has been done and redeem it in some way. Of course, there’s no way to truly make it right, but it’s all he can do at that point. And, that’s why I think the criticism I pointed to above is so off the mark. It’s as if the writer of that essay just didn’t read the last part of the book. Clearly, Ender is deeply troubled by the part he played in the Bugger genocide, knows how he was manipulated, understands that it was morally wrong, and seeks to make it right. In that way, the message of this book is extremely moral. EG: But that does give me a thought. What if the story had not included the “redemption” of Ender? Suppose, we get to the end, after the Buggers have been destroyed, and we merely see Ender leave Earth with Valentine? I mean, yeah, it is a moot point since the Bugger legacy is left with Ender and obviously future books deal with that, but I have to admit, I would still have sympathy for the tragic figure of Ender even without him coming to discover the truth about the Buggers and taking on the role of “Speaker For the Dead” for them. OG: I hadn’t considered that but it’s true that as I was reading it I was completely sympathetic to him before I even had read the concluding portions detailing Ender’s discoveries. That’s a very good point. So, one final thing I wanted to address concerning the major reveal of the book (that the battle simulator is not really that at all and that Ender is in fact really killing Buggers) is how it works narratively. I believe I effectively demonstrated in our “American Gods” discussion that I am quite dense. Not getting the obvious Low-Key/Loki clues and the like. But, I have to say that I remarkably knew exactly what was up once Ender and his compatriots were in the simulator. And, not because I’m especially smart (I have to believe that you weren’t fooled by this at all EG), but because I read the back cover of the book prior to reading it. The blurb on the back begins… “Andrew ‘Ender’ Wiggin thinks he is playing computer simulated war games at the Battle School; he is, in fact, engaged in something far more desperate.” Just the words “thinks he is playing” was enough to reveal it all to me. How obvious is that!?!?! I’d see that blurb every time I picked up the book to read and the phrasing never left my head. And, once we got into the simulator room, the words were banging me in the forehead saying “SEE! SEE! He only THINKS he’s playing a game!” Stupid blurb. It didn’t ruin my enjoyment of the book really, but just really irritated me. Of course, you’re probably about to tell me that this should have been obvious to anyone just reading the words from left to right. Go ahead. EG: Okay…well, I wasn’t going to mention it. I mean, seriously, I made doubly sure not to say, “You know, I figured out that the ‘simulations’ were actual battles relatively soon after the introduction of Mazer Rackham,” but since you brought it up…yeah, I figured it out But, to make you feel better, I think you would’ve figured it out as well just from straight reading. Since you talked about reading the back of the book and receiving a bit of a spoiler, let me just say I’ve stopped reading the backs of books, the prefaces, the introductions…even most reviews. I was spoiled pretty badly in the intro of a book about a year ago, which blatantly revealed the “twist” of the book, and it completely ruined the book for me. So, I now wait until I’ve already read the book before I read any of those things. OG: I think I’ll be adopting that practice myself from here on out. EG: But, that is really neither here nor there. Back to the topic at hand! OG: You know, the best thing I can say about how good this book was is that I’m dying to read “Speaker for the Dead” now. I want more of this world and want to see what Ender does next. Knowing that “Speaker” was actually conceived of first and is considered by many to be the superior of the two only amps up my excitement. How about you? Any concluding thoughts? EG: Actually, while I was aware of the sequels to this book, I hadn’t heard that “Speaker” was supposed to be superior. Hmm. We’ll have to keep that in mind for the future. Oh, and one more thing: Knowing you are the third born in your household, I feel compelled to refer to you as Third from now on. OG: I shall wear the title with pride! (And, while neither of my older brother’s skinned any squirrels alive, I did witness them shooting frogs with BB guns, so that probably counts.) Oh, by the way, I’m busting out the full 5 Running Steves for this one. Easily. EG: Well, Third, I’m going to give this one 4.5 Running Steves. I might’ve gone up to a 4.75, but I don’t want to fool with making a new graphic for that, so this book will have to settle for next best thing from me. OG: Cool. You know, I heard there’s a movie in development for this one. You think they’re really gonna keep the characters the ages they are? I can’t imagine. I mean, he does a good enough job making it work in the book, but there’s no way a modern movie audience will be able to get on board with that. EG: Honestly? Even advancing the kids by four or five years wouldn’t work. I don’t think a screen adaptation of this book would remotely work. I mean, if people wanted to sit in a darkened theater watching kids playing video games for a couple of hours, the long-form commercial known as The Wizard (starring TV’s Fred Savage) would have been a blockbuster. Obviously, we’re a day late for the “Ender’s Game” book club discussion. And, we’ll probably be another day or two more. If you need someone to hold accountable, please send all your blame to me, OG. It’s all my fault. 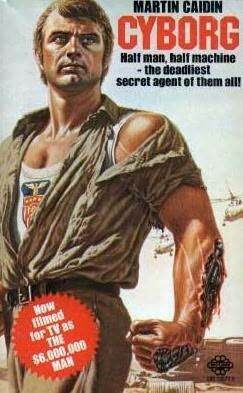 This book was adapted into the TV series “Six Million Dollar Man” and we thought it’d be fun and fitting to have a discussion on this one since neither of us have actually read it. Unfortunately, it’s currently out of print, but is still available at many libraries and second hand book outlets. Again, my apologies for the delay on March’s discussion. If you are a regular reader of this blog (which is technically not possible since there would have to be regular posts in order for it to be regularly read) than you’re already well aware of how lame I am. Now you have one more thing to add to that list.